You want things to be easy because you have a busy life. The last thing you need is a high maintenance indoor plant that takes up too much of your time. Good thing for you, we’ve found five indoor plants that are not only low maintenance but prefer low light. Plus, these five plants can improve your health and boost your mood at the same time! In our “Low Maintenance Indoor Plants,” we’ll suggest 5 of our favorite indoor plants, how to best to care for each one, discuss their light needs, and pet safety levels. This episode is meant for anyone looking for indoor houseplants that are super easy to care for. Check out our podcast Show Notes below with the links to each of these 5 different plants! There are so many wonderful reasons to keep indoor plants in your home. Luckily, it doesn’t matter what size your home is because most indoor plants thrive in lower light and can be grown anywhere. For the most part, indoor plants tend to like temperatures of 55 degrees or higher and require either indirect or direct light, and possibly a combination of both. Indoor plants that need direct sunlight should be placed in a windowsill or other sunny location. Direct light means a plant needs to be placed in an indoor location where the sunlight directly shines on its’ leaves. Any other location where the sun can directly hit the plant leaves. Indirect light refers to light which means a plant needs to be placed in a location where the sunlight does NOT directly shine on the plants’ leaves. Indoor plants that require little to no direct sunlight are easy to place around your house. The Heart Leaf Philodendron is a favorite in our house for its ability to thrive anywhere in the house! Most houseplants offer tons of health benefits for you to enjoy in addition to their beauty and color. We favor houseplants that offer numerous health benefits, are low maintenance, need little light, and are safe for our young, curious dog. 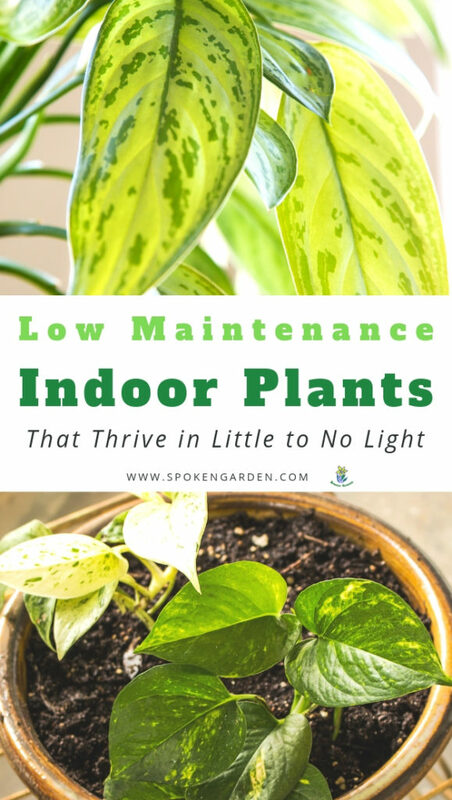 Listen to this podcast to learn plant care tips for each of these plants as well as their light needs and pet safety. Click each picture below to link directly to Amazon so you can purchase these now! One of the most popular and easiest to care for indoor plants. It resembles compact wide-leaved grass. Thrives in low and indirect light and prefers to be hung versus on a shelf or windowsill. Spider Plant. Buy it now on Amazon by clicking the picture. Another popular indoor house plant and very easy to care for. It produces flowers that are modified, spike-like leaves, or what’s called a Spathe. It is a trailing vine and will certainly grow out. Heart Leaf Philodendron. One of the 3 best indoor plants. Click the image to link to Amazon so you can buy your own! A very popular indoor house plant that is super easy to care for. It will multiply all by itself. Its leaves resemble individual sword-like blades shooting right up out of the ground. Its leaves are waxy and thick. Its leaves can be multiple colors of green, yellow, and/or white. Snake Plant, or Mother-in-Law’s Tongue. Click the image to link directly to Amazon. Needs moist, but not wet soil. For light level, it needs bright indirect light. This plant can reproduce by air-layering on stems for new roots for form and then cut and plant in a new pot. Best location in your home is to either side of a large window or door, below a skylight, or other areas with bright indirect light. For pets, it is toxic to dogs with ingestion leading to loss of appetite, vomiting, drooling, and diarrhea. Even rubbing up against the plant can cause skin inflammation. Is native to South Africa. Is easy to maintain and needs to be treated as a succulent plant with infrequent light watering. It likes direct full sun, but is ok with lots of bright indirect light. It can reproduce by vegetative cuttings of stems with leaves or even just leaves. The best location in your home is by pools, on windowsills, and decks outside in warmer times of the year. For pets, it is toxic and can cause vomiting and incoordination. There are so many other indoor house plants, but Allison and I really like these and we hope you do too! See ya in the Garden! Want to Learn to Plant Like a Pro? Subscribe to our Spoken Garden community and receive your FREE Bulb planting cheat sheet! Included in the cheat sheet for you: Tools you will need for proper planting of your bulbs, different types of garden bulbs, steps to plant successfully, and more! Click the graphic above to save “Low Maintenance Indoor Plants” to Pinterest for later! Learn how you can easily care for your own indoor plants. 5 specific indoor plants with a breakdown of their maintenance requirements, light needs, and pet toxicity levels. Recommendations for indoor plant accessories, maintenance supplies, etc.